for diving. They were great! country because it is pretty darn massive and takes a long time to get from Point A to Point B.
to see more stuff in Bali. Smells: Different spices; the rain; grilled fish. Lombok and Gili Trawangan; soothing Balinese music. underneath sea level; Sanur; Seminyak; Yogyakarta (Java); Borobudur; Jakarta. as sweet as sugar; nasi campur; Bintang beer; 'java'. Street Food: Fun tropical fruits; rice in banana leaves. Dunkin' Donuts; Starbucks; KFC; The Coffee Bean; Cold Stone Creamery; Sizzler. Visa needed? Yes. Can get this on arrival. It is $25 for up to 30 days. Yogyakarta of 25,000 rupiah. The international departure tax from Jakarta was 100,000 rupiah. Type of currency? The Indonesian Rupiah. About 9400 rupiah is equal to $1 US. Religion: Hindu (in Bali) and also parts that are largely Muslim. 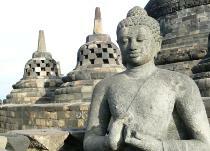 Stupas at Borobudur in Java. 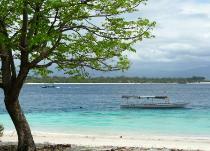 Amazing water colors in the Gili Islands. 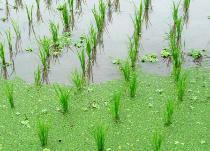 A close-up of the rice paddies.